Most orders placed by 3pm EST ship same day! Sea Sprae gray cover fits 8ft Mercury inflatables. This is a custom boat cover designed specifically for the Achilles LSI 290 Model. Available in 12 colors. Our covers also feature an elastic shock cord to ensure a taught fit. This is a custom boat cover designed specifically for the Achilles LSI 310 Model. Our covers also feature an elastic shock cord to ensure a taught fit. Color is Sea Spray Gray. This is a custom boat cover designed specifically for the Caribe Inflatable DL12 Model. Cover will fit over 2 and 4 stroke outboard motors. Our covers also feature an elastic shock cord to ensure a taught fit. This is a custom boat cover designed exclusively for any Novurania 335 DL model with out bow or hand rails. Available in 12 colors. Cover will fit over 2 and 4 stroke outboard motors. Our covers also feature an elastic shock cord to ensure a taught fit. This is a custom boat cover designed exclusively for the 310 SLRX with Seat and Console. Cover will fit over 2 and 4 stroke outboard motors. Our covers also feature an elastic shock cord to ensure a taught fit. Inflatable Boat Cover, Blunt Bow, by Taylor Made. This Hot Shot Acrylic Fabric is a light-weight alternative that provides better water, mildew, and UV resistance than its poly-cotton counterparts. We know that taking care of your boat is your utmost priority so use 303 Protectant to provide UV protection and repel dirt and suntan lotion stains. 303 UV Protectant brightens surfaces and keeps them looking newer, longer. The Walker Bay Breeze Sail ONLY with Bag and Rig. For the WB8 and WB10 BREEZE ONLY. The Hypalon 2016 Odyssey high pressure drop stitch floor weighs only 62lbs and comes with a collapsible fiberglass transom, airkeel, tow rings, fiberglass seat, oars carry bag, pump and Orca Hypalon. Free Shipping to the lower 48 states. This is a custom boat cover, measured and designed specifically for the Bay Runner Pro,500 2013 Model. This cover will cover both two stroke and four stroke motors. Our Sea Sprae® boat cover is constructed from a durable acrylic coated polyester. This fabric weighs 7.25 oz per square yard and is stabilized for minimum stretch and shrinkage while offering excellent tensile and tear strength. Sea Sprae® is water and dirt repellent as well as resistant to mildew and UV rays. Available in Gray or White. The award winning Sunbrella® fabric is made from solution-dyed acrylic yarns. This fabric is fade-resistant and stands up easily to all kinds of weather including salty air. At 9.25oz per square yard, Sunbrella fabric is one of the heaviest in the industry. Sunbrella fabric is water repellent, mildew and UV resistant. Plus, Sunbrella fabric is woven, which makes it breathable, so it doesn’t trap heat and moisture like vinyl. Nor will it tear or shrink. This is not a generic mass produced cover. This is a custom boat cover, measured and designed specifically for the Zodiac Yachtline 2013 Bay Pro Runner 500. Cover will fit over 2 and 4 stroke outboard motors. Our covers feature an elastic shock cord to ensure a taught fit. When installing the cover, make sure the inside tag is at the stern. Stock colors are Cadet Gray and Natural “White”.10 CUSTOM COLORS Available. WE DO NOT ACCEPT RETURNS ON CUSTOM COLORS: Pacific Blue, Jet Black, Royal Blue, Aquamarine, Charcoal Tweed, Captain Navy, Burgundy, Linen, Forest Green and Logo Red. 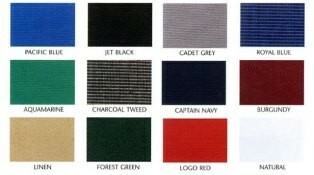 Since our custom colors must be constructed to your specific order, please allow at least 2 weeks for their delivery. 303 High Tech Fabric Guard and Water Repellent is an advanced fluoropolymer fabric treatment specifically developed for exterior applications. 303 Fabric Cleaner is safe and effective on indoor and outdoor fabrics, carpet and upholstery. Replacement oarlocks with Stainless Steel pins for Zodiac Cadet Series and YL RIBS - sold as a pair (Zodiac Part #ZDC67502). Zodiac Semi-Recessed valve cap gasket (O-ring). The Zodiac Semi-Recessed Valve is used on many of the Cadet Yachtline, Fastroller, Touring Futura, Cherokee, and Pro RIBs. Semi-Recessed valve cap gasket (O-ring). (Zodiac Part #ZDC6851). Can be used on any Hypalon inflatable boat, but is specific to AB, Caribe, Apex, Avon, Novurania, Nautica, TUG and Walker Bay inflatables. Orca brand available in Artic Gray (light gray), White, Navy, Black and Military Gray. Square Foot. PVC Bimini Mounting Pads for Inflatable Boats, Pair. Bixler's Marine has made mounting a bimini a whole lot easier. These bimini mounting pads are made up of a stainless steel heavy duty deck hinge jaw mounted to a PVC fabric with heavy duty backing, sold as a pair. Inflate your boat safely and in half the time with the Bravo 10 double chamber high volume foot pump with separate "top off" chamber to prevent over inflatation. Visual pressure indicator to protect against overinflation. Achilles, Avon, older Zodiac Medline and Yachtline RIBs and Other Inflatable Brands Inner Drain Plug, with Housing, for Rigid Hull Floor. Valve diaphragm and support for Zodiac semi recessed valves. Works with all semi-recessed valves on RIBS, recent Cadets, and Zodiac Sport Boats. Will fit the Classic Mark 1 Valve. (Zodiac Part #Z60055). Compatible with both quarter turn cap and screw cap style semi-recessed valves. 2018 Inflatable Boat Parts. All Rights Reserved.